Now we have poor hunting conditions in the Bering Strait touted as evidence that “walrus migration patterns have changed” with the implication that this is because “…the past eight years have had the eight lowest amounts of summer sea ice on record” due to man-made global warming. A subsistence lifestyle is hard, particularly so if it depends on a highly mobile, migratory herd animal. Think Barren-ground Inuit caribou hunters, who often starved because herd sizes declined for a few years or moved unpredictably. Many factors – seasonal weather, last year’s winter conditions, size of the herd, food supply – all affect where and when a migratory herd will move and the likelihood it will be positioned for optimal harvesting by hunters. Add another highly variable factor into that – Bering Sea ice – and you have a highly unpredictable food supply, especially if you sit in one spot (like on St. Lawrence Island) and expect that migratory herd animal to come within reach. Hunting walrus from St. Lawrence Island depends on just the right combination of ice and winds. Too much ice is not good, too much open water is not good, and too much wind is not good. The people of St. Lawrence Island and the Bering Strait that depend on walrus for subsistence have my sympathy, they indeed have a hard life – but this is not a tale of woe about the status of Pacific walrus and changing summer sea ice. Bering Strait natives hunt walrus in spring, from mid-April to early June (Huntington et al. 2013). All indications are that walrus are moving differently than they used to in summer because the population is now very large. As far as I know, there is no new population information on walrus that wasn’t available last year, when I covered this topic extensively (Crockford 2014; video below). “Her brother caught two animals this spring and shared the meat and fat, but it didn’t go very far in the village of 150. She’s thankful for what she got, though. It’s become increasingly difficult to land a walrus. Other remote communities at the edge of the Bering Sea also are seeing a steep decline in walrus harvested the past several years. 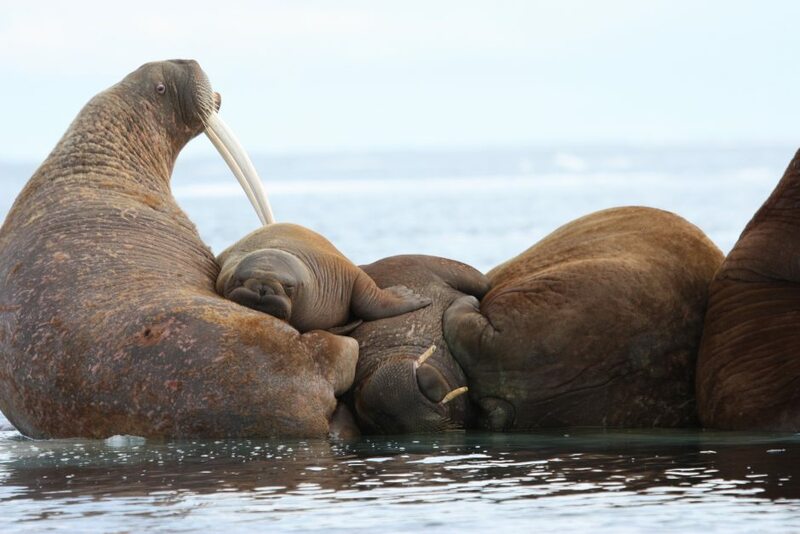 Walrus, described by some as having a taste between veal and beef, is highly prized by Alaska Natives as a subsistence food to store for winter, with the adult male animals averaging 2,700 pounds. The sale of carved ivory from the tusks, legal only for Alaska Natives, also brings in supplemental income to communities with high unemployment rates. Hunters and scientists say walrus migration patterns are veering from historical hunting grounds as temperatures warm and the ocean ice used by the animals to dive and rest recedes farther north. Village elders also tell biologists the wind is blowing in new directions. 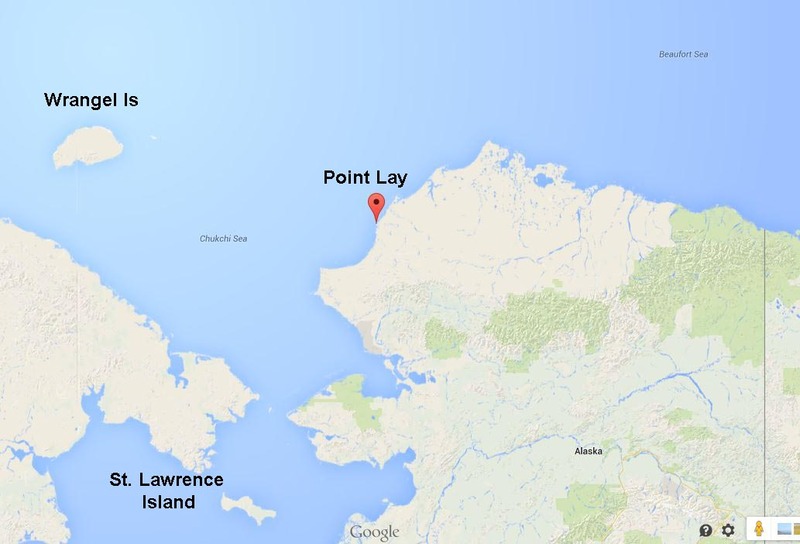 In 2013, a late-season icepack clustered around St. Lawrence Island, blocking hunters from the sea. “I think one of the biggest issues is that things have gotten so variable. It’s hard to really predict what’s going to happen,” said Jim MacCracken, Alaska walrus program supervisor for the U.S. Fish and Wildlife Service. Iver Campbell and other Yup’ik Eskimo hunters from two St. Lawrence Island communities harvested more than 1,100 walrus in 2003. But a decade later, hunters managed to take only 555 — a fraction of the ideal of one walrus per resident, per year. Things still aren’t looking any better for the 1,430 residents of the villages of Gambell and Savoonga. The recent spring take was 233 walrus, according to preliminary Fish and Wildlife figures. The shore ice once served to block the wind for hunters but that’s no longer the case, said Campbell, who’s lived all 64 years in Gambell, population 713. Science backs that observation. According to the Office of Naval Research, the past eight years have had the eight lowest amounts of summer sea ice on record. This year, 10 walrus were harvested, according to Diomede hunter Robert Soolook. There’s no shortage of walrus, he said, but they’re migrating sooner. No one has initiated any long-range planning to address the shift, but Soolook believes hunters eventually will need to change their practices, even going out earlier. Read the rest here. Something similar was reported last month (8 July 2015). However, no mention is made in these stories of the low spring ice in 1979, nor of the documented variability of Bering Sea spring ice. Sea ice extent in the Bering Sea varied over their period of study (1979-2009) from a low of 130,000 km2 (in 1979) to a high of 256,000 km2 (in 1999). Ice in 2012 was higher than 1999 by a considerable amount and it was reached in May. Brown, Z.W., van Dijken, G.L. and Arrigo, K.R. 2011. A reassessment of primary production and environmental change in the Bering Sea. Journal of Geophysical Research 116:C08014. doi:10.1029/2010JC006766. Crockford, S.J. 2014. On The Beach: Walrus haulouts are nothing new. GWPF Briefing 11. The Global Warming Policy Foundation, London. Pdf here. Huntington, H.P., Noongwook, G., Bond, N.A., Benter, B., Snyder, J.A., and Zhang. J. 2013. The influence of wind and ice on spring walrus hunting success on St. Lawrence Island, Alaska. Deep-Sea Research II 94:312-322. Pdf here. This entry was posted in Life History, Sea ice habitat, walrus and tagged Alaska, Bering Sea, Chukchi Sea, climate change, migration, polar bear, prey, sea ice, spring, St. Lawrence Island, subsistence hunting, summer, video, walrus. Bookmark the permalink.